PROF. WOLFFF, a german band from Ulm, started in the early 70's and unfortunately produced only one album. Remarkable is the use of lyrics in german similar to FLOH DE COLOGNE. Despite that the band never had a political approach the lyrics are provoking a lot though trying to digest the rebellious times in which they lived. This is combined with the typical mix of blues, folk and psychedelia which can be also defined as krautrock. As a result, other musicians must have been inspired for sure to compose rock songs using the native german language. The band was busy with gigs all over germany and also had a TV appearance. The first line-up consisted of Klaus-Peter 'KP' Schweitzer (guitar, piano, vocals) who basically managed the songwriting, Rolf-Michael 'Romi' Schickle (organ), Detlev 'Mondo' Zech (bass), Michael 'Sam' Sametinger (drums, percussion) and Friedrich 'Fritz' Herrmann (guitar, vocals, harmonica). Where does the obscure band name come from? It's pointed out somewhat legendary, mysteriously. One of several possibilities: Schweitzer was sitting in a cafe and asking the waitress for the name of a unrefined looking man. The answer was: "Prof. Wolfff" and he spontaneously decided to use this label. 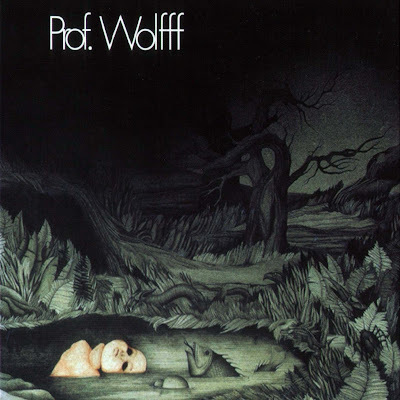 PROF. WOLFFF recorded its self-titled album in October 1971 at the Jankowsky studio, Stuttgart. It was produced by Jonas Porst, the manager of IHRE KINDER. The original vinyl release contains 5 songs whereas two of them nearly reach the 10 minute mark. Raw guitars and prominent hammond organ like PROCOL HARUM or DEEP PURPLE give a heavy rock appeal. On the other hand you can find two folk songs with chorus vocals as well as classical motifs which are making this album unique as a whole. The Second Battle CD reissue from 1998 also contains the shortened radio mix of the song 'Hetzjagd' as a bonus. Some months after the release the band split unexpectedly. One reason was that Mondo Zech had to join the civil service. Fritz Herrmann changed to the bass and moved on together with Romi Schickle under the new name PROF. WOLFFF ENSEMBLE. Musically remarkable is the reorientation at instrumental jazz rock. Peter Bochtler played the drums furthermore with the support of several guest musicians until Detlev Joe Rodius (guitar) became a constant member. The band toured until the disbanding early 1974 but never produced a release at all. PROF. WOLFF has been brought to life once again in the second half of the 70's by Herrmann who went to Munich and gathered several musicians of the local scene (MISSUS BEASTLY, MUNJU, EMBRYO) to play improvised jazz rock/fusion. The final split took place in 1982.